Tanglewood schedule week 5, August 3-9, 2012, Tanglewood On Parade. Tanglewood schedule week 5, August 3-9, 2012 features Christoph Von Dohnányi, Yefim Bronfman, And Jean-Yves Thibaudet; Lorin Maazel leads the world premiere a new composition by Michael Gandolfi On August 5; Chris Botti and his band in concert August 5; Tanglewood On Parade is all-day August 7. Baritone Gerald Finley moves from Ozawa Hall to the Shed Friday, August 3, to join maestro Lorin Maazel, a TMC fellow in 1951 and 52, and the BSO for Ravel’s Don Quichotte à Dulcinée and arias from Così fan tutte, The Marriage of Figaro, and Don Giovanni by Mozart. The program also includes Ravel’s colorful Alborada del gracioso and Daphnis et Chloé, Suite No. 2, a BSO specialty and a work that was performed in the first Tanglewood season in 1937-as well as Mozart’s Symphony No. 38, Prague. Mr. Maazel once again takes the podium Sunday, August 5, to lead the BSO in a program featuring the world premiere of a new BSO-commissioned work by Michael Gandolfi, who was a TMC Fellow in 1986 and has been a member of the TMC Faculty since 1997. The elegant and engaging French pianist Jean-Yves Thibaudet also participates in this program, as soloist in Saint-Saëns’s Piano Concerto No. 5, Egyptian. The concert concludes in thrilling fashion with Berlioz’s Symphonie fastastique, another work at the heart of the BSO repertoire and which the orchestra first performed in 1885. On Saturday, August 4, the BSO welcomes two of the most popular Tanglewood guests of the past two decades: conductor Christoph von Dohnányi and dynamic pianist Yefim Bronfman. Mr. Bronfman takes center stage in Brahms’s sweeping Piano Concerto No. 2, and the orchestra shows its muscle in Schumann’s Symphony No. 4. 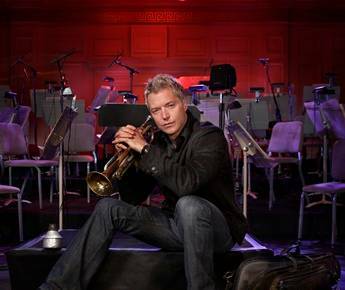 Chris Botti, who last performed at Tanglewood in 2009 with the Boston Pops, performs in Ozawa Hall Sunday, August 5. One of the festival’s most beloved traditions, Tanglewood on Parade (Tuesday, August 7), is a chance to see all of the festival’s orchestras perform in a single extended concert. Mr. Maazel, Mr. Dohnányi, Stéphane Denève in his Tanglewood debut, Keith Lockhart, and John Williams share the podium for a program that will include Beethoven’s Overture to Egmont, Ravel’s Mother Goose Suite, and recent film scores by Mr. Williams, as well as the traditional TOP finale, Tchaikovsky’s 1812 Overture. This lively evening features performances by the BSO, the Tanglewood Music Center Orchestra, and the Boston Pops, culminating in a dazzling fireworks display.